It’s a house and a home. Sometimes, it’s a workspace. Most often, it’s a place for your family members, pets and animals. Sometimes, it’s all of the above. Noel and Jennifer P. had a special vision for their property in Bastrop, Texas. You could call it their dream home, but that’s only the half of it. Because steel buildings are completely customizable, most folks don’t want to pigeonhole themselves into one application, when there is no limit to their design needs or opportunities. After looking at Armstrong Steel’s vast resources online, and speaking with a project manager, Noel came up with a completely custom structure. “First of all, Armstrong Steel was able to deliver a unique ‘Barndominium,’ and it’s really the perfect living space. It’s not your average building, though. Where else can you get a two story home, complete with workshop space AND a pool? That’s what we got, and we love it,” said Jennifer. For customers looking to take control of their own projects and costs, Armstrong Steel proves there isn’t an easier way to buy a steel building. When a first time builder make the choice to purchase a building straight from the manufacturer, they don’t have to suffer extraneous costs from an expensive middleman; they can pick and choose different aspects of a building project on an individual basis while receiving elite level customer service. "Everyone at Armstrong does exemplary work and is so nice and helpful. We also want to say how much we enjoyed working with our project manager. He is very knowledgeable in so many areas and was wonderful to work with,” said Noel. While many first time builders erect their own building, Noel and Jennifer utilized a contractor to erect their Barndominium. Even the qualified construction experts noticed how easy the structure went up, and they erect dozens of buildings per year. “The local company in Bastrop, TX that we hired to erect the building couldn't have been more complimentary about the quality of the building and the ease in which it went up. They were so impressed with the structure! The building is exactly what we were hoping for. Thank you from the bottom of our hearts for a job so well done,” said Noel. Quality is never an accident; rather, it is always the result of intelligent effort. Accountability and constant improvement are an integral part to the continued success of Armstrong Steel, and we hold our products and processes to the highest standards. We work with the best technology, American made materials and carefully developed internal and external processes. “I could tell all of the work was done with such care, skill, and precision. When a few panels showed up the wrong length, Armstrong Steel was so quick about getting new replacement panels on site. It all went smoothly and we're glad we chose Armstrong Steel,” said Noel. 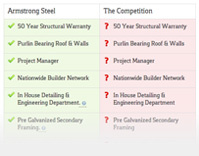 "We would highly recommend you, your company, and all of your employees to anyone looking to purchase a steel building. It was a pleasure to work with you. We can't put into words just how much we love our finished Armstrong Building! The covered porch and the rest of the building turned out beautifully. Armstrong Steel did an amazing job,” said Noel. "My husband and I get tons of compliments on our building from everyone who visits. We’re always happy to recommend Armstrong Steel to every single person who walks through the doors. We like to call it our own permanent vacation spot. Armstrong really made our dream come true, and we look forward to enjoying it for years to come," echoed Jennifer. Armstrong Steel is America’s preferred steel building manufacturer specializing in commercial, agricultural and residential projects. We’ve been known to create the occasional permanent vacation spot as well.